Rob N: I should perhaps come clean and begin by admitting that Captain America #182 wasn't actually my first Captain America comic, but sadly the advance of senility combined with the fact that I didn't buy that title in my early years of comic collecting means that the memory of my actual first issue is lost to posterity. It could have been anything, to be honest, and probably was. The thing is, I wasn't actually that keen on Cap to begin with. Yes, he was the mainstay of the Avengers, but he seemed a bit old fashioned even by Marvel standards, what with him lecturing Rick Jones and the 'Teen Brigade' (a worrying concept these days in light of Operation Yewtree) on the importance of getting at least eight hours sleep each night instead of riding around on Chopper bikes pretending to be the Fonz from Happy Days. He was a bit too clean cut and patriotic for the early 1970s when all the world seemed to be growing its hair long and protesting against Vietnam. I perhaps missed the point of Cap to begin with – that he was indeed a Stranger in a Strange Land, relegated to an era he didn't fully understand, and trying desperately to come to terms with it. By the mid-'70s writers like Steve Englehart took that concept in interesting directions when, with issue #175, Cap had his moment of doubt in the concept of Truth, Justice and the American Flag. At the culmination of a long running 'Secret Empire' saga he tracked down the leader of the villainous cabal that was out to corrupt American society to the very offices of the White House itself. There, in the heart of Government, Cap unmasks the villain as central to the US Government, though we don't see his face ourselves. The man commits suicide and Cap is left shaken with the realisation that... shock, horror... politicians may not always be honourable men! (Relax, this is only comic books – it could never be the case in real life). The storyline was influenced heavily by the Watergate scandal at the time, though Englehart was at pains to point out that he had commenced the long running story as far back as issue #163, and at that time the intention was that the evil mastermind would turn out to be Richard Nixon himself. Whether that would have got past the editorial division is another matter, but in the end we are left speculating exactly how important this Government figure was. What is apparent is that his rank is enough for Cap to lose faith in his ideals and, after an issue of soul searching (Captain America #176), Steve Rogers announces he will be Captain America no more! These days of course hardly a month goes by without dramatic revelations of this kind in the pages of Marvel or DC, but in the Sixties and Seventies dramatic change was, well, just that – very dramatic, if only because it rarely occurred. This was a serious development on a par with Gwen Stacy dying, and many readers were left wondering how on earth Marvel was going to publish a comic called Captain America without a Captain America in it. What Marvel did was to have Cap (in issue #180) decide to create a new identity for himself: the Nomad ('The Man Without a Country'). With a new blue and yellow costume - that briefly included a cape on the grounds that Cap had always admired Thor's cape - he set out to leave his previous identity in the past. The cape only lasted a single issue however when, after pursuing the new Serpent Squad, he trips on it and falls over. The new Serpent Squad was comprised of the Cobra, the Eel and Madame Hydra - taking on the role of the Viper (after seeming to rescue the original Viper from a prison van, only to kill him because she wanted to use the name). Their aim was to seize the Serpent Crown of Ancient Lemuria (a tie into Marvel's Robert E Howard titles at the time, notably Kull The Conqueror, thereby making Kull and Conan part of the Marvel Universe) and raise the sunken kingdom of Lemuria from the bottom of the ocean. Right from the word go Madame Hydra is a very different kind of Marvel villain. Steve Englehart depicts her as a particularly psychotic terrorist in the vein of the Baader Meinhof. While the Cobra and the Eel are typical comic book villains simply out to rob a bank and get rich quick, Madame Hydra is demented beyond all reason. Which brings me then to issue #182, an issue of memorable intensity at the time, for reasons I shall now explain. Reading Marvel comics in the mid-to-late 1970s was sometimes a frustrating experience because by then the writers had got into the habit of weaving convoluted plots that often crossed over into other titles. 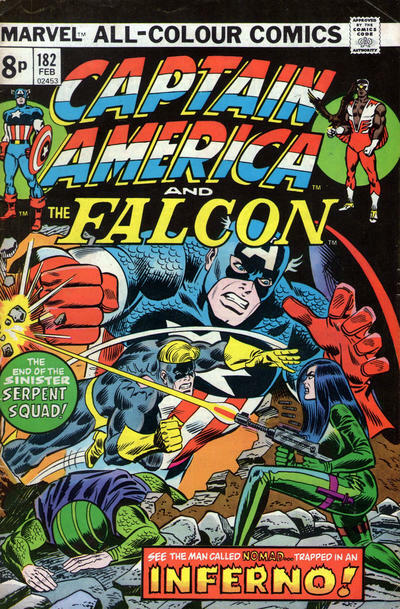 Such was the case by the time I read Captain America #182 because between issues #181 and #182, the Cap storyline involving the Serpent Squad had crossed over into the pages of Avengers, but unfortunately, since issue #120, Marvel had stopped importing Avengers into the UK. The same held true for other titles such as Amazing Spider-Man, Incredible Hulk and basically any title that might confuse elderly newsagents used to stocking British B&W reprint titles of the same name. In fact, Marvel had decided to import only 20 titles each month into the UK, and that was one of the reasons I had started to buy Captain America – because most of the titles I really wanted to buy (Avengers!) were no longer available. This meant I had no idea what had just happened previously, but obviously it had been something major because by issue #182 the Serpent Squad had come a cropper, as now the Cobra and Madame Hydra were making a last stand with machine guns in a building surrounded by armed police. With the building under siege, Cap-as-Nomad tries to intervene only to be clubbed across the back of the head by police officers who think he'll get himself killed if he charges in there. After all, it's not as if he's a professional hero like Captain America... The Cobra is practically wetting himself in terror as he realises Madame Hydra/Viper has no intention of either of them surrendering. But Madame Hydra is having none of it. As she machine guns down the first wave of police who try to storm the building, she informs the Cobra that they will both die as martyrs. Artist Frank Robbins draws Madame Hydra at her demented best with the sort of fanatical intense look and heavy eyeliner you expect early '70s German terrorists to be be born with. The building soon catches fire and as Cap/Nomad tries again to intervene the battle turns into an inferno with a by now whimpering and terrified Cobra (who probably HAS now wet himself) trying to surrender and being gunned down in the back for disloyalty to 'the cause'. Eventually the house collapses into a heap of burning timbers as Cap narrowly claws his way out with the badly injured body of the Cobra. Madame Hydra it seems has had her wish to die fighting. By the standard of comics of the Seventies this was a particularly psychotic episode demonstrating a side to a Marvel villain that we hadn't seen before. Even the Red Skull didn't go quite that far. It wasn't until the likes of Frank Miller and Alan Moore began writing stories that I came across villains of such intensity again. 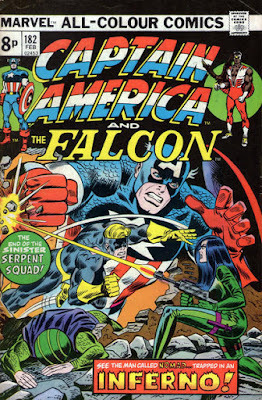 Eventually of course Steve Rogers returns to don the familiar star-spangled costume through a moment of tragedy, and within a year or so the title was to change dramatically once more when the legendary Jack Kirby returned to Marvel to take over the scripting and pencilling. But that, as they say, is another tale altogether.